This product is REACH compliant. Grip Range 0.150" - 0.312"
Rivets/Ribbed provide a neat appearance and once in place, the internal threads are ready for a screw or bolt. 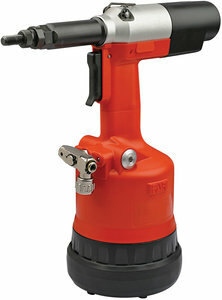 Additional features of the ribbed rivet-nut include: Increased torque strength over conventional style, 360° knurled expansion after setting, vibration resistance and large flanged head which increases push out strength. Available in steel only with yellow zinc dichromate finish and in a wide range of sizes: 6-32 thru 1/4"-20, 5/16 and 3/8-16, M4 thru M10. Standard and extended grip ranges are available in each size Lightweight tooling assures easy installation by the operator and reduces costs when compared with other methods. 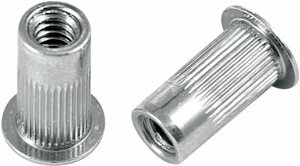 After installation, Rivet-Nuts/Ribbed provide permanent, captive threads that do not allow loosening under vibration and will not rotate when attached to the mating material. Rivet-Nuts/Ribbed with large diameter heads can be used in soft materials which inherently offer little, if any thread strength. The flathead design provide the most bearing surface for higher torque applications. The larger flange extends above the material in which it is installed and provides a built-in spacer. Some restrictions apply, login to see shipping methods.